Definition at line 52 of file llmessageconfig.cpp. Definition at line 55 of file llmessageconfig.cpp. Definition at line 78 of file llmessageconfig.cpp. Definition at line 86 of file llmessageconfig.cpp. Referenced by LLMessageConfig::getConfigForMessage(), LLMessageConfig::getMessageFlavor(), LLMessageConfig::getSenderTrustedness(), LLMessageConfig::getServerDefaultFlavor(), LLMessageConfig::initClass(), LLMessageConfig::isCapBanned(), LLMessageConfig::isValidMessage(), and LLMessageConfig::useConfig(). Definition at line 168 of file llmessageconfig.cpp. References lldebugs, llendl, and mCapBans. Definition at line 139 of file llmessageconfig.cpp. References LLSD::isMap(), llendl, llinfos, mCapBans, and LLSD::size(). Referenced by loadFile(), and LLMessageConfig::useConfig(). Definition at line 94 of file llmessageconfig.cpp. 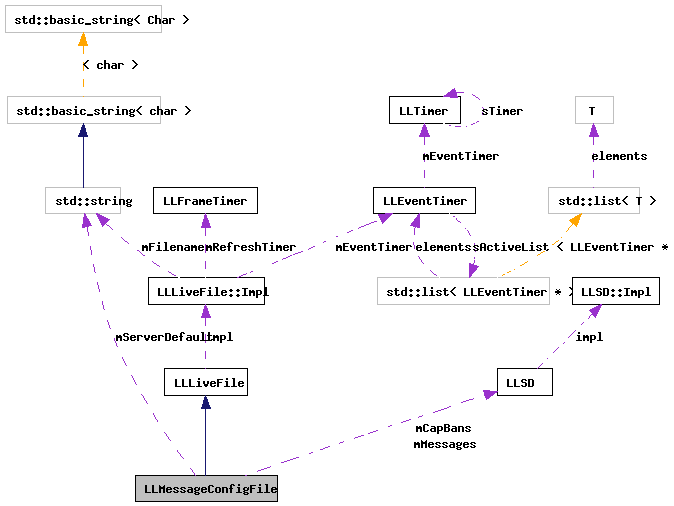 References filename(), LLSDSerialize::fromXML(), LLSD::isUndefined(), llendl, llifstream, llinfos, loadCapBans(), loadMessageBans(), loadMessages(), and loadServerDefaults(). Definition at line 155 of file llmessageconfig.cpp. References gMessageSystem, LLSD::isMap(), llendl, llinfos, and LLMessageSystem::setMessageBans(). Definition at line 125 of file llmessageconfig.cpp. References LLSDXMLFormatter::format(), llendl, llinfos, mMessages, and LLSD::size(). Definition at line 120 of file llmessageconfig.cpp. References LLSD::asString(), mServerDefault, and sServerName. Definition at line 75 of file llmessageconfig.cpp. Referenced by isCapBanned(), and loadCapBans(). Definition at line 61 of file llmessageconfig.cpp. Referenced by LLMessageConfig::getConfigForMessage(), LLMessageConfig::getMessageFlavor(), LLMessageConfig::getSenderTrustedness(), LLMessageConfig::isValidMessage(), and loadMessages(). Definition at line 62 of file llmessageconfig.cpp. Referenced by LLMessageConfig::getServerDefaultFlavor(), and loadServerDefaults().